I was inspired today to start a new type of blog post - Training Tip Tuesdays. For the past 2 weeks, we've really been concentrating on the basic, core aspects of each discipline, the most prominent being handstands in acrobatics. Every day we've done the same exercise - handstand from the front, and handstand to the side from cartwheel; both sides, 10 times each, arms up in position for the duration of each set. While I could see the exercise improving my handstands (and exhausting me by handstand 5), I didn't see past that. However, I had a moment of realization today when our acrobatics teacher said that not only would we do this exercise for the whole year with variations, but how holding that shape would help things such as diving through hoops and back-handsprings. That's when it really hit me: in almost every circus discipline, core handstand techniques will benefit you. Wire walking, aerial, tumbling, dance... they could all benefit from handstands. I don't have any recent pictures of my handstand at Circadium, so here is one from the beginning of my audition process in December. 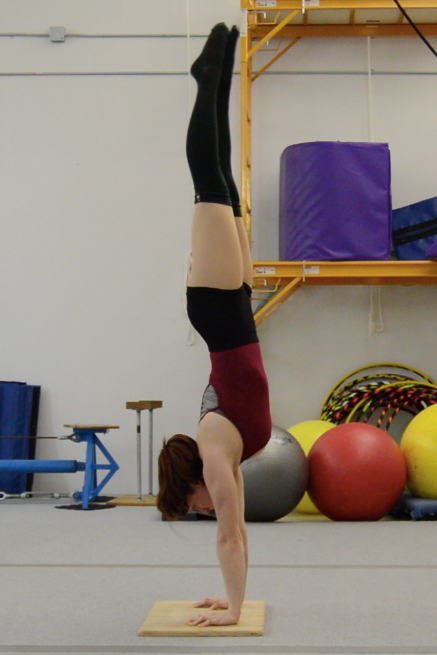 I'll have to get some recent handstand pictures and compare them soon! For those of you not as familiar with the minutia of a being upside down, let me break apart one of the biggest key aspects of handstands - extension. For a strong, elegant handstand, you need to be pushing down from your core, through your shoulders, arms, and fingertips into the ground, while simultaneously pushing up from your core, through your hips, legs, and tips of your toes into the sky. That length, that extension that you achieve from hours of handstand practice, is found in almost every other disciplines. I found this image for a visual. I'll admit, I'm not the best at working on the basics on my own. Prior to Circadium, I would often wiz through a few warmups before working on fun tricks, because the basics bored me. Why work on holding a regular handstand when you can try to hold it on one hand! I also didn't have a coach telling me where I was going soft (and may had a slightly inflated ego because I was often training handstands at Planet Fitness), so cool tricks were much more entertaining to practice. But since the core exercises are all we've focused on since arriving at Circadium, it's been much easier to see the benefit they have provided. It was really impactful to take a moment to see all the cross connections throughout the disciplines. Our juggling coach tells us all the time how juggling and wire walking will help in any discipline, which I can see. However this handstand connection was even clearer for me, and drilled home once again the importance of training the basic, core exercises. So no, I had not been doing round-off back-handsprings or practicing crazy drops on fabric just yet. I have been (and will continue to be) focused on training a strong, hollow body shape, and will spend most of my time working not on fancy tricks, but just the basics. Happy training!